It's always exciting seeing lions in the wild. If you're lucky, they'll be close enough to photograph. Whenever I return from an African safari with one or two reasonable lion pictures, I count myself lucky as these magnificent predators are often spotted only in the distance. Even when you do see them at close range, there's a good chance they'll be fast asleep! 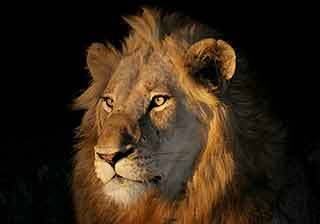 This gallery of lion images was taken in South Africa (mainly Kruger National Park) and Botswana. If you love African wildlife, click below to check out our exciting range of Wildlife T-shirts and Apparel available from Amazon.com. 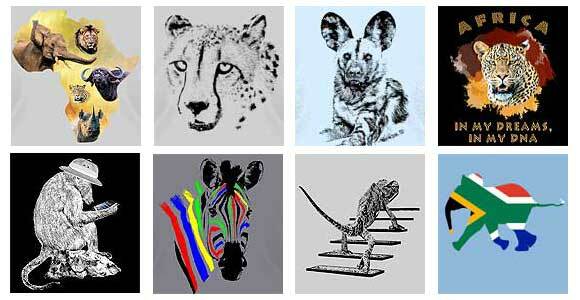 The unique designs, based on original wildlife photographs, range from bold and colorful to subtle and understated. Have a look! The picture of the battle-scarred male lion with an injured eye (Row 4, pic 1), plus the one of the lion relaxing under a tree after a good feed (Row 6, pic 1) were both taken some years ago with an Olympus C2100 UZ digital camera. Although this is only a 2.1 megapixel camera, it has an amazing image-stabilised 10x zoom lens, giving you the equivalent of a 38mm to 380mm lens on a 35mm camera. When you add the Olympus B300 1.7 converter, you are armed with the equivalent of a 640mm lens. That's what allowed me to get a full-frame photograph of the lion with the bad eye. I've since graduated to digital SLR cameras, moving through the Canon EOS Rebel range and now use a Canon EOS 50D and old but reliable Canon EOS 450D. For wildlife photography, a reasonably powerful telephoto lens is essential. Most my photographs of lions have been taken with various Canon lenses I've owned, including the Canon EF 100-400mm f/4.5-5.6 L IS USM, Canon EF 70-300mm f/4-5.6 IS USM, and Canon 400mm f/5.6 L USM telephoto lenses. The Canon 100-400mm zoom is popular amongst wildlife photographers because of its reach, versatile zoom range, and image stabilization. When fitted to a digital SLR body that has the smaller APS-C sensor giving you a 1.6 crop factor, it's like using a 160-640mm lens on a 35mm film camera. That zoom range will give you plenty of scope for photographing lions, allowing you to place the subject in context by including the surroundings at the wide end, while also being able to zoom in close for intimate lion portraits. It's a great lens when on safari in Africa, particularly if you're restricted to photographing wildlife from a vehicle, as is normal in the national parks and luxury safari lodges of South Africa, Botswana, Kenya and Tanzania. If you'd like to find out more about lions and their behavior, see Lion Information or Lion Facts.